I have been so excited and looking forward to World Book Day. My son is going to nursery dressed as a Highway Rat (his nursery is celebrating tomorrow). A costume I spent hours slaving over….honest guv…not a click & collect….erm….OK….I CONFESS! While other parents may have been sweating blood & tears, feet in blisters trailing every inch of every craft shop to prepare for the big day I cheated and got a ready made one. You have to understand, at school it took me THREE YEARS to sew an apron. That’s right. THREE YEARS…the teacher gave up on me. I also made a cushion at high school. Stuffed with plastic bags rather than lovely soft cushion foam. I forgot until the last minute and it was the best idea I could come up with. So trust me when I say that me not making a costume is for the best. Otherwise I’d need to start making it for an 18 year old rather than a 4 year old…. Anyway, I’m going off topic. World Book Day. Yes. We love it in our family. Yes the costumes are fun etc etc but the main thing for me is that it gets children talking about books. It gets teachers talking more than usual about books and importantly it gets parents talking about books! If we’re engaged and invested then the children become engaged and invested. Talk about books you like and don’t like. Ask questions about the books they are reading. It can be hard to find time to read to them – even bedtimes can be a struggle if parents work late. My husband is rarely back for bedtime during the week but reads to them at the weekends. I read whenever I can to them and always have a book to hand…car journeys, if we go to coffee shops, restaurants, anywhere we might be queuing or waiting. Books are a great way to keep kids entertained until their food turns up! There are loads of little pocket books that you don’t need a suitcase to carry. I remember my mum used to read to me at the dining table while I was eating or having a snack….even when I was on the potty. Here is a link to the fantastic BookTrust with various useful reading tips. Well, one book that has been everywhere with us*, is Charlie Changes Into A Chicken written by Sam Copeland. Charlie McGuffin is a boy with an incredible secret….when he feels anxious and worried HE CHANGES INTO ANIMALS. All sorts of animals. Spider, flea, pigeon and even a rhino! This book is a bonkers, laugh out loud kind of a book and covers some sensitive topics in a unique way that is very relatable to children. Charlie is worried about his brother in hospital, the school bully and appearing on stage (my son hate’s going on stage in front of everyone so could empathise quite well with this). He has to find a way to deal with his new power and luckily has his three best friends to confide in. Children will love reading this book or having it read to them (if they can wrestle it off their parents first – I found myself reading it well after son was in bed!) Though be warned, there’s a lovely (happy) lump in your throat moment towards the end that had me reaching for the tissues. Cannot recommend this book highly enough. Such a beautiful read and the amazing illustrations by Sarah Horne perfectly match it. Sam Copeland is an author and literary agent living in London. His favourite part about writing the book was writing about the friendship between the characters and feeling the characters come alive. Having read it I can understand this. You can close your eyes and imagine them in real life. They’re the kind of best friends that don’t just get you out of trouble after it’s happened but the ones that come along with you for the ride to make sure you’re ok. I couldn’t not ask Sam the question (note to author – apologies if it’s the 100th time you’ve been asked!) If he could change into any animal, what would he change into? He answered that he’d love to turn into something microscopic like a myxozoa as it would give him a truely unique view of the universe. Also, as Sam pointed out it makes a great scrabble word! And if Sam were a flea and could jump on anyone’s head for the day without them noticing he would jump on a dog as “animals are far more interesting than people”. This is a good point. People all tend to do similar things get up eat, go to school/work, come home, eat, go to bed…boring stuff (except of course for Charlie who is very unique). However, there are sooooo many varieties of animals…including ones with weird names like myxozoa…. “I want to go as Blaze from Blaze as the Monster Machines!” my son said about World Book Day. A a children’s book blogger, writer and reader a little bit of me died inside! Have to be honest…I’m all for freedom of expression but in this case not on my watch buddy!! I negotiated with him and told him that he could pick something from a book for World Book Day and when it was World Television Day, I would make him a Blaze costume…he seemed happy with this solution thank goodness!!! The week leading to World Book Day is such a great opportunity to engage children in reading, discussing and engaging with books of all varieties. Children have such varied tastes and imaginations. There’s been a lot recently on whether parents should have a say on what their children read and discourage comics and so called babyish books. Some people might disagree with me and parents know their own children, however, my overall opinion is no they shouldn’t. Children should be free to read read read!!!! Yes there are books that have some things that they might not understand or maybe outdated thoughts… children’s books written back in the day might be sexist, or racist but isn’t it good to be able to talk about these topics and explain how things have changed or what still needs changing? As for things like comics not being proper reading material…I used to read The Beano and would love for my child to do the same. It didn’t stop me reading “proper stories”. An early childhood memory I have is Sunday mornings my parents would always be reading in bed. I’d take my book and climb in between them. Sometimes I’d ask to read their books outloud to them. They never said no. I learnt new words and new concepts. Reading books with my parents meant we spoke about them, could have conversations about them. Now with my own boys (well at least with my 4 year old), I talk about what I’m reading in simple terms. “It’s a mystery book” or “It’s a book about an elderly man who doesn’t have a family” (A Man Called Ove by Fredrik Backman – if you’ve not read it please do. Make sure you have a box of tissues handy for the tears will come. It took me 2 days before I could pick up another book!). My son asks questions which I try and answer in an age appropriate way and when he asks if he can read these books I tell him “when you’re able to read for yourself you can read whatever you want!”. I let him pick out the books at bedtime – if it’s his 2 year old brother’s picture book that he wants to look at I let him and never tell him that’s baby-ish. My mum is my biggest reading inspiration. She used to read to me on the potty, while I was eating lunch, in the mornings, in the afternoons, in the evenings. Even now, she always has a few books on the go. Books can be funny, sad, happy, unsettling, mysterious and eye-opening. They can open new worlds of imagination. They can be used as topics of conversations, they can be used to educate, encourage empathy and can help children to understand their own emotions before they have the vocabulary to express themselves. They can only do all of these things if we give our children access to them. Let children read comics, short books, long books, books that are too young for them, books that are slightly beyond them. Let kids read poetry, magazines, fairy tales. Just let them read for reading is learning and learning is life. If you are stuck for World Book Day Costumes (and even if you’re not!) I highly recommend Timothy Mean and the Time Machine by the lovely William AE Ford. I was lucky enough to be sent an e-copy by author William and my son enjoyed it so much not only did I want to write a review but I’ve just bought 2 paperback copies – one for the house and one for my 4 year old’s nursery! William was born in Britain and now lives in Oslo. His favourite books as a child were The Hobbit and Lord of the rings. He loves the magical worlds and adventures created by Tolkien. The idea for Timothy Mean came from watching his children play and how they use their toys and imagination to role play. He often makes up story’s for his children at bedtime and has been writing for about 7 years. If you could go back in time where would you go? Would love to hear your comments!! …He’s still a baby if he’s turned one right? Well, think they’ll always be my babies no matter how old! Anyway, my youngest turned one and in spite of everyone in the house having winter lergies, we had a wonderful day of fish and chips and a visit to the aquarium. I think my son and his huge appetite would have tried to eat the fish there too, given half the chance! He got a couple of books for his birthday – doesn’t matter how young children are. Reading is a great way to encourage their language and vocabulary. Personally for me, more importantly it’s a great way to bond and the happy shrieks and giggles we get from reading George’s favourites are priceless memories. pop-up book given to my eldest a couple of Easter's ago by a close friend. It's about a hungry little chick. George gets the giggles whenever the pop up beak tries to "peck" him. Very simple sentences and so much fun. I've also just seen apparently there are a series of books such as Charlie Learns to Fly and Charlie Chick Goes to School. eviewed this before but it's still one of our favourites. A fantastic book that introduces children to noises. Beautifully illustrated and lots of fun. eorge loves this serious of lift the flap books. It was one of the first books I read to him. The flaps are made of felt and are so easy for little fingers to grab but not so easy for them to tear. We have Where’s Mr Lion? and Where’s Mrs Hen? Very colourful and really grab their attention! A bright book, George was kindly given for his birthday, featuring Maisy Mouse. Teaches little ones colours and gives examples of each one. George has recently learned to point at objects that aren’t just food related and has great fun pointing at random things in the book. Another birthday book, this one is full of peekaboo surprises. Have to be a bit careful that George doesn’t grab things too hard (my eldest has Woof! Woof! from this series and ripped the dog’s head off when he was about the same age as George). Such a sweet series particularly this bedtime book! What’s your little one’s current favourite bedtime story? Would love to hear from you! It’s all about the party fruit have when everyone’s asleep. So “Swing your hips, shake your pips and let’s get all excited!” Such an enjoyable book that my son loves doing the moves to. There’s also a website attached with a video (link below) though if I’m honest the book is fun enough without it. 3. I read books I would never otherwise have read! It comes up with suggestions of books to try, which leads to finding out about authors I’ve never heard. Now I’ve got hundreds of books all at the click of a button. However, it makes me worry. 1. My kids may never see the covers of the book I’m reading and ask about it. 3. They may think I’m just looking at another computer screen. I hope not and my intention is to talk about the books I’m reading. 4. Will they still enjoy books just as much even if they’re on an e-reader? There are loads of children’s’ books in the house so it’s a worry for another day but the article really made me think about how my children will perceive books in the future. Would love to hear your thoughts on the article too and if your children are older with e-readers. What a lovely week! I’ve been fortunate to have been asked to do a monthly blog for a wonderful charity, Motherwell Cheshire CIO so watch this space! Also I’ve volunteered to do a regular storytime at Hanwell Library in London which starts on the 9th November. Very excited and looking forward to it! We’ve also got a wonderful new addition to our book family (it was recommended by a lovely lady on a Facebook thread) It’s such a sweet amusing story I just had to share!!! This is a story about a pout-pout fish with a pout-pout face spreading his dreary-wearies all over the place! (Think we’ve all had those days! 😂) It’s not his fault…it’s the way he was born…or so he thinks! This has lots of repetition and rhyming, alongside colourful characters. It’s a great one for the under sixes. Really love this book and so did my 3 year old. Here’s the link below. Have a great weekend! Hope you enjoy this Halloween Rhyme! That knocked my sister in the ditch. So tried it on the dog. Turned an orange shade of blond. To make her stop being so cross! So yesterday I had the wonderful opportunity to read some Autumny type books to pre-schoolers at Sandhurst Library. Today I’m enjoying reviewing some of them! I took Cedric the Squirrel along and the children enjoyed cuddles with him. 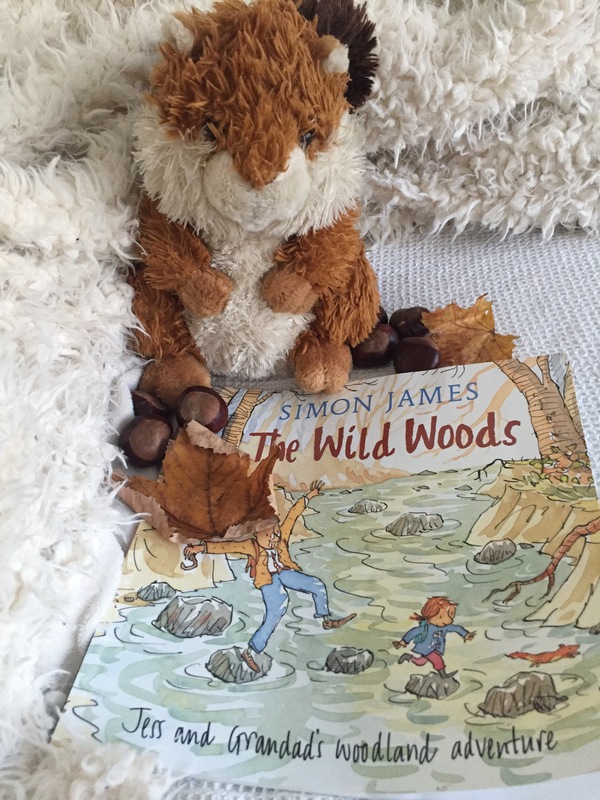 Here he is snuggled up with his leaves, conkers and a great book! A squirrel, a duck and a bagpipe playing cat all live together in harmony making pumpkin soup. Each has their own job to do. One day, the duck decides he wants to do something different and it doesn’t go down well at all! This would be a great one perhaps for reception classes as it shows what the cat and squirrel think has happened to the duck after he’s waddled off in a huff. Children can have so much fun guessing and using their imaginations before the end is given away. Beautiful illustrations too. Personally, I loved reading this story. A scarecrow and various creatures all need shelter from the snow. Such a gentle beautiful book and so good for repetition. The children could “help out” with the story. Just wonderful! Would make a great soothing bedtime story. What are your favourite Autumn children’s books? This week Sandhurst Library have very kind in asking me to lead a storytelling session on Thursday and it’s Autumn themed. I’m so flattered that they would like to hear some bits that I’ve written alongside some Autumn type books. Golden leaves are falling. What a crunchy sound!!! Furry squirrels playing hide and seek with the acorns that they find. When Autumn springs to mind.